Therefore | Therefore | What the GDPR Means for You! The GDPR (General Data Protection Regulation) is new regulation designed to align privacy laws throughout the European Union and protect the personal data of its residents at home and abroad. As a globally active organization, Therefore Corporation welcomes the new regulation as a step in the right direction towards strengthening personal privacy rights. 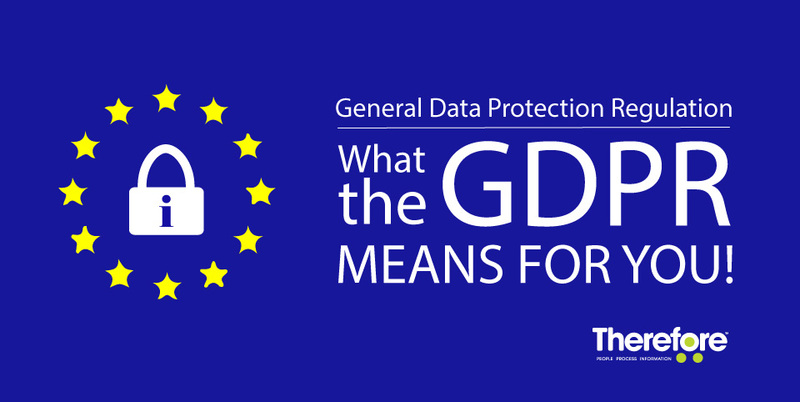 The GDPR is complex and requires significant effort and investment by any affected entity. The new regulations will come into effect in May 2018, and organizations that hold personal customer information will be required to adhere to it. The penalties of a data breach can be quite substantial, so it is important to begin preparations early. Therefore Corporation strives to help you achieve compliance with the GDPR by offering an information management solution that allows you to store, find, and catalog the personal data retained by your organization and create a more secure data environment. Furthermore, Therefore™ offers resources that simplify the monitoring and management of the personal data you retain within the system, and provides tools to help you meet the GDPR’s reporting and assessment requirements. In this webinar, we explore what the GDPR is, what you need to do to prepare, and how Therefore™ can help you achieve compliance.